I was thrilled to watch the Cubs celebrate their Central Division-clinching win on national television today and before a full house at Wrigley. It seems they’re always clinching on enemy territory — the Pirates come to mind (and yes, in my 33 years it’s happened with relative frequency — 1984, 1989, 1998 [wild card], 2003, 2007, and now 2008). 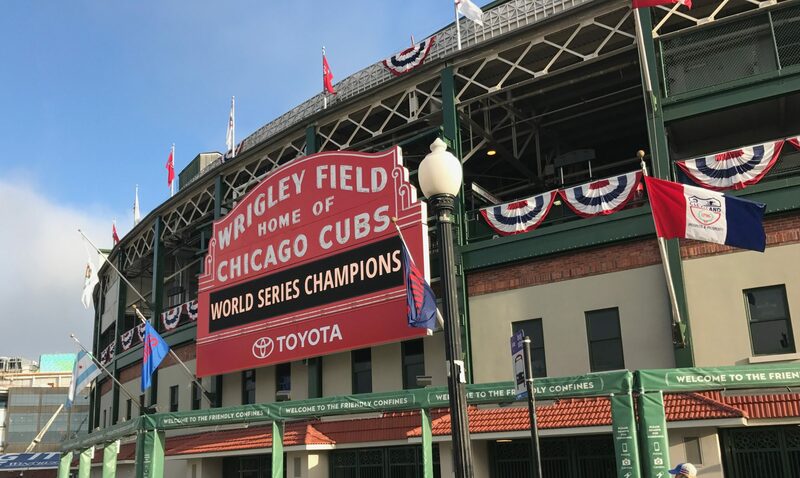 But this is the first time the Cubs have won back-to-back division titles since they three-peated in 1906-1908 (winning their last two World Series in 1907 and ’08). I’m in Las Vegas (the Cubs are 9-5 favorites to win the NL Pennant; 4-1 on the Series) at the Blog World Expo but — my heart was in Wrigley… and the victory cry I heard just now on Channel 9 News at Nine as bellowed by Ron Santo was something else — I’ll have to get audio. I’d like to thank Jim Hendry and Lou Piniella and the greatest Cubs team I’ve been fortunate to cheer on — the 2008 Cubs. For now, video below, and even the hat is pretty cool. Now back to regularly scheduled weekending and BWE08 activities.